Dickie Attenborough, Steve McQueen, James Garner – where are you when I need you? I need help in digging our escape tunnel from Shakespear! The uniforms are being stitched together, the forged passes are being printed and the clever devices are sewn into the trousers ready to surreptitiously dispose of the diggings onto the parade ground whilst the Germans stand guard ………. well, perhaps that’s going a little too far but it does feel a little like we need to tunnel out of here, you will see why shortly. It was our 35th wedding anniversary last Monday, and we celebrated in our usual manner in that we exchanged our perpetual cards – these are the same card we give each other, each year, once given they go back in the drawer ready for next year! Tuesday morning and Roy had an appointment with an ophthalmic surgeon to have a small hole lasered into each eye. After the initial consultation, he was 5 minutes in the chair and it was all done with little fuss and with no after effects or problems. Wednesday was pack up time for us to leave the SCC (Self Contained) parking area at Shakespear as the van was going in to have the brakes sorted…. We hope. We stayed with Leslie (Steve was away) for the night before heading back to pick up the van on Thursday afternoon. But oh dear, the brakes are not fixed properly as we need to replace the calipers and of course there are no available parts here in NZ so these need to be sourced from the USA which of course means we wont be leaving here anytime soon whilst we wait for their arrival and then of course the fitting of them. But brakes are pretty important so best we get them sorted once and for all. Heavy sigh, I was never very good at being patient but never mind, there could be worse places to be stuck. So here we are back in the main campground at Shakespear where we will be for at least the next two weeks whilst we wait for the parts to arrive. We are told that it’s no problem for us to stay on and as we are continuing with our camp host duties as it’s a huge help to the staff here. These days, birthdays and anniversaries seem to roll around with regular monotony with Sunday 13 March being our 34th wedding anniversary. We don’t usually go overboard on the whole celebration thing for our anniversary, but we do like to mark the occasion. 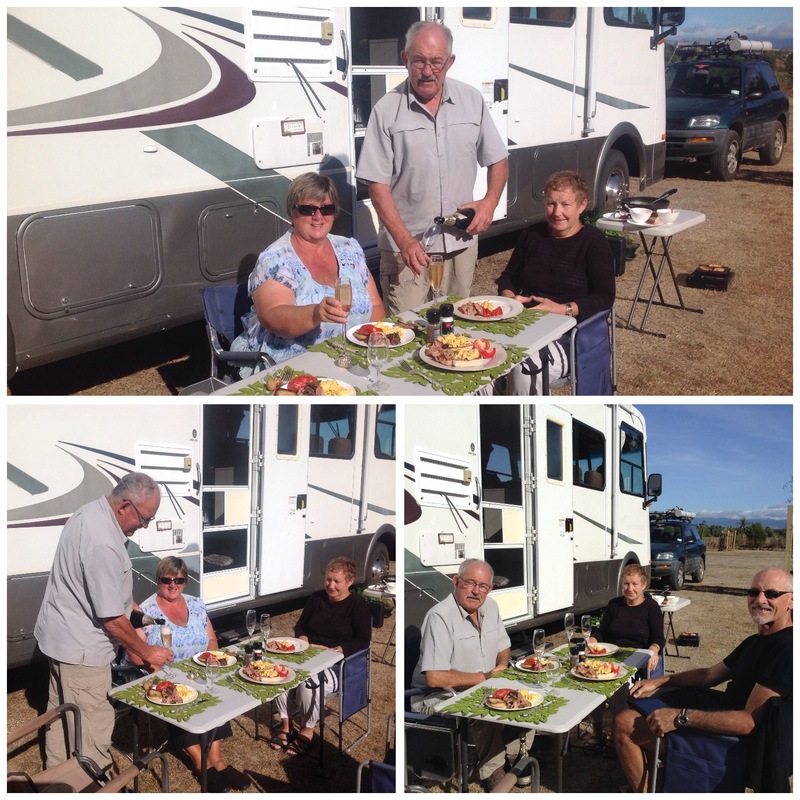 And this year we could share the day with our good friends & fellow motorhome buddies Pat & Sue by starting the day off with brunch. A long leisurely brunch was accompanied with bubbly and finished with hot cross buns and coffee, we didn’t need to eat for the rest of the day as we were all so full after our lovely brunch. Whilst chatting, we reminisced over what we remembered of our wedding day. Bernice remembers sitting in all her finery at her parents home in front of the TV with a glass in one hand and a cigarette in the other (well, we almost all smoked back then didn’t we?) watching the cricket. NZ opening batsman Bruce Edgar was on 99 and I was waiting for him to score his century before going off to get married, but then rain stopped play for the day. I was only 5 or 10 minutes late I am sure!! Meanwhile Roy was at the Putaruru Club being ‘well looked after’ or so I am told, by my brother John and friends including Kevin. He can’t have been late because he was there when I got to the ceremony. I must add that our ceremony was conducted by a friend of ours who was not only one of the first celebrants but also one of the first female celebrants, and it took place in a lovely garden setting. So here we are 34 years later, although it is really more like 38 years as we did live together for 4 years before tying the knot, and what an adventure it has been so far. We have lived all around the country, travelled a few miles off shore and are still traveling. Here’s to many many more. 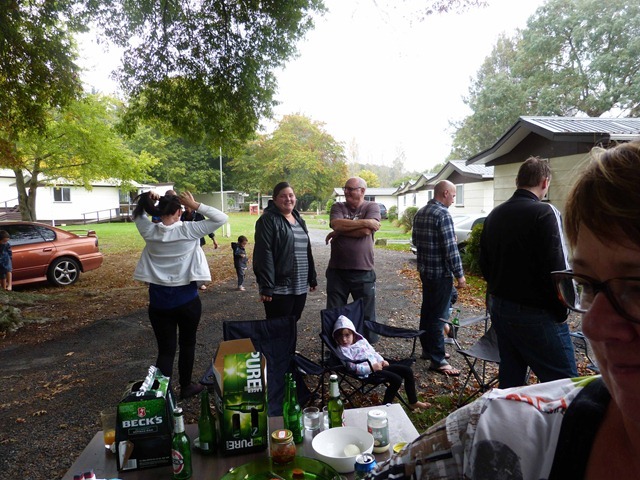 It was Auckland Anniversary weekend this past weekend and it also was the last weekend before schools start for the year which meant a full house in the camp ground. 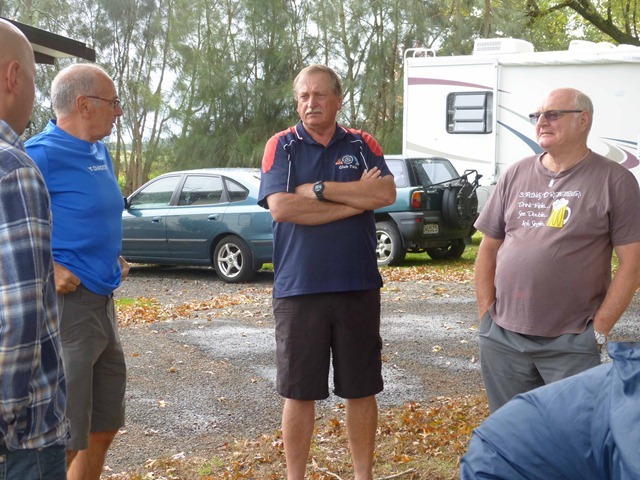 Most of the campers were made up of family groups with many of them intergenerational. 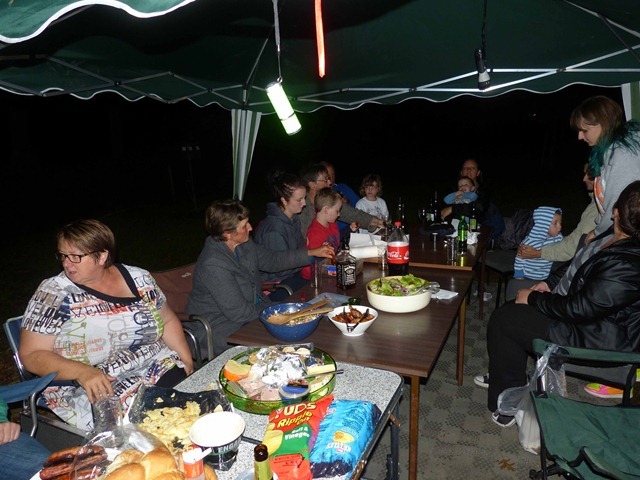 It makes for a fun and entertaining weekend watching the comings and goings, the games played, children learning to ride bikes, grandparents trying to keep up, soccer games, cricket games – with a very serious match being played by a very competitive Indian family group one evening. We joined in their competitive fun by playing the third umpire role which resulted in much hilarity and some serious discussions about rules and interpretations but all good fun. 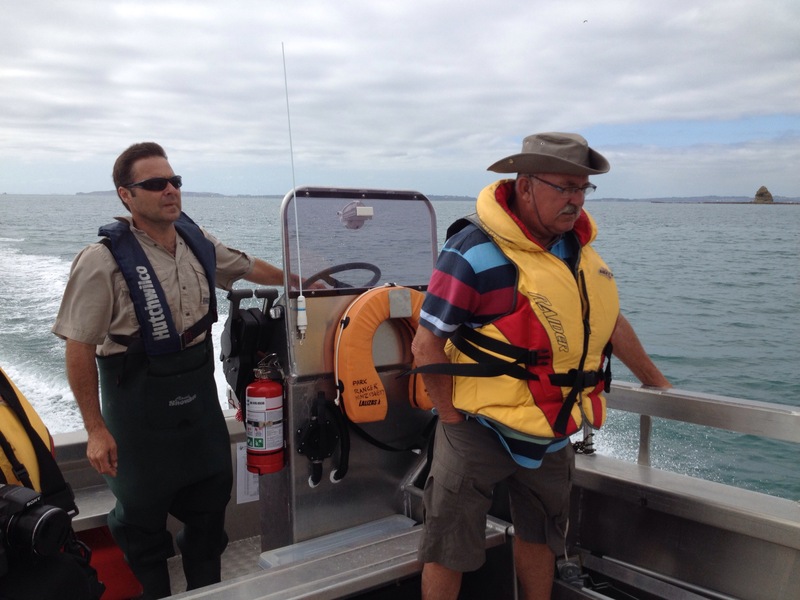 Steve & Les were back for the weekend, Roy and Steve went out fishing a number of times but only had success on their first foray out returning with some very nice snapper and a good sized kahawai which was smoked. The snapper was shared with some other campers and we had a lovely meal of snapper with some of Steve’s home grown green tomatoes. We also had a few other visitors over the weekend. Roger and Ruth came for a visit as it has been a little while since we have caught up with them both. This friendship goes back a long way, Roy and Roger started school together at Cockle Bay (just a few years ago) as 5 year olds so they have known each other quite some time. 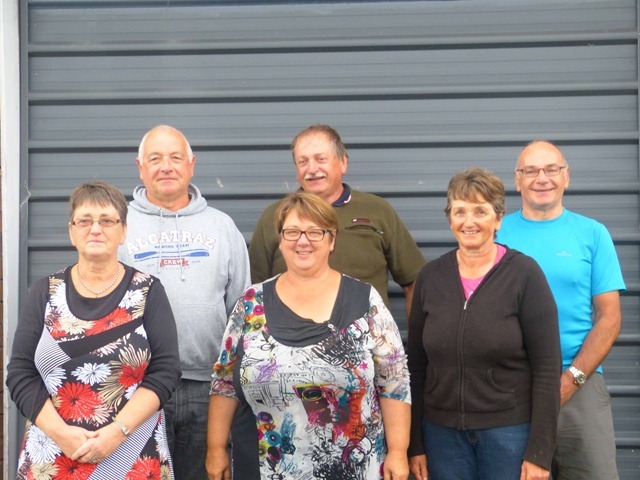 Roy and I spent a lovely few weeks with Roger and Ruth cruising the waterways on their canal boat in France which you can read about starting at this entry. After catching up with all their news and generally chatting, we had a lovely shared lunch before we all retreated to the beach to cool off with a long swim in the sea. Before too long it seemed the day was disappearing and Roger and Ruth had to head home but not before promising we catch up again soon. Once again, I forgot to take any photos – too busy enjoying the moment! Our next visitor was our son Antony who came up for the day and we also went swimming to cool off after lunch. It helps that high tide has been around midday over the past few days and we have been able to get a good couple of swims in each day. Antony had to go home in the late afternoon on Monday along with most of the campers, so we go from a full house of 160 down to 37 last night and only 19 tonight before we are back to a full house again this weekend for Waitangi Day. Over the last weekend we noticed a strange light in the evening sky, after a bit of investigation we discovered that the light was part of an installation to mark the Tamaki Herenga Waka Festival over Anniversary Weekend. 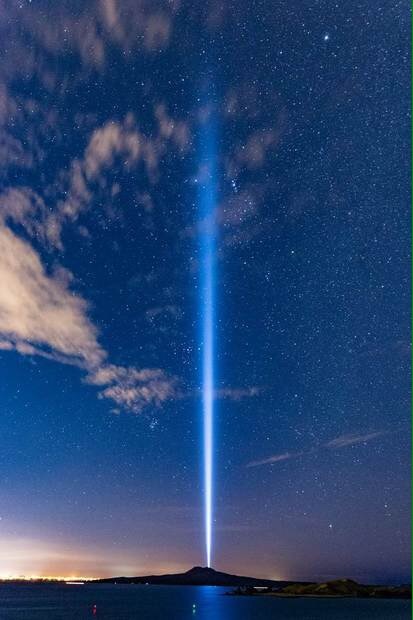 The light beam was intended to echo the form of traditional hitching posts or mooring for waka (Maori canoe) and would only be switched on for the three nights over the weekend. You know how sometimes life just seems to race on regardless of plans? well the past few weeks have been just like that. A whir of people have come and gone and although we have been busy with people, it is all done at our usual pace, by that, I mean the slow, casual, carefree way that has become our lifestyle. Helen & Don returned to join us a for a week of relaxing, reading, swimming, enjoying good food and even playing the odd game of cards. The weather has been utterly brilliant so there is no excuse but to spend all day every day outside. We were very fortunate as one day the head Ranger Bruce informed us that he was having to go to Mahurangi to skipper the boat that delivers cleaning staff to outlying islands where there are baches/cribs/rustic holiday homes to rent and if we got to the beach at a certain time, we would be able to enjoy some time out on the water with him. Bruce bringing in the boat whilst lowering the front drive on ramp. We visited a number of bays and islands, all stunning locations with their own unique attributes. It was a great way to spend a morning. 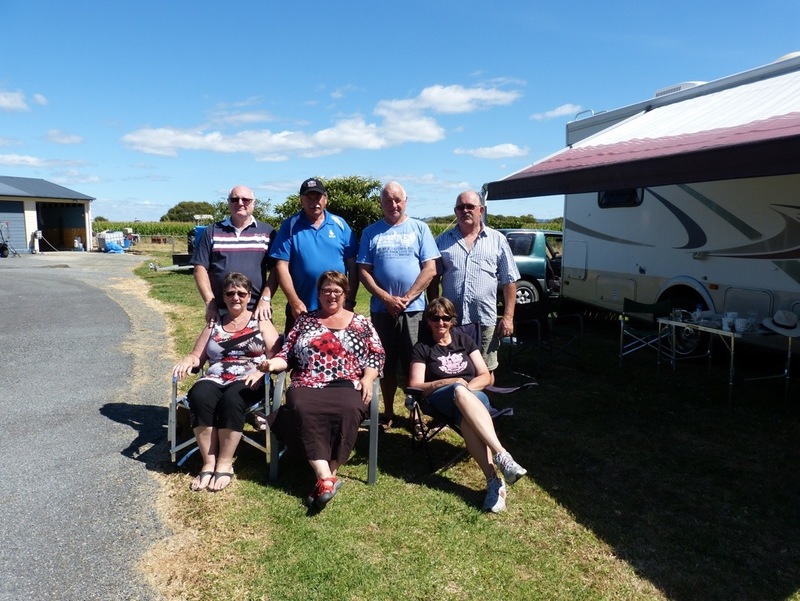 That same day we did a bit of a tiki tour and visited some of the other northern Regional Parks visiting Tawharanui, Mahurangi East & West and Wenderholm on our return journey. We introduced ourselves to our counterparts at the other Parks as well as Rangers and got a good feel of the other Parks, coming away convinced that we are at the nicest Park – of course!!! 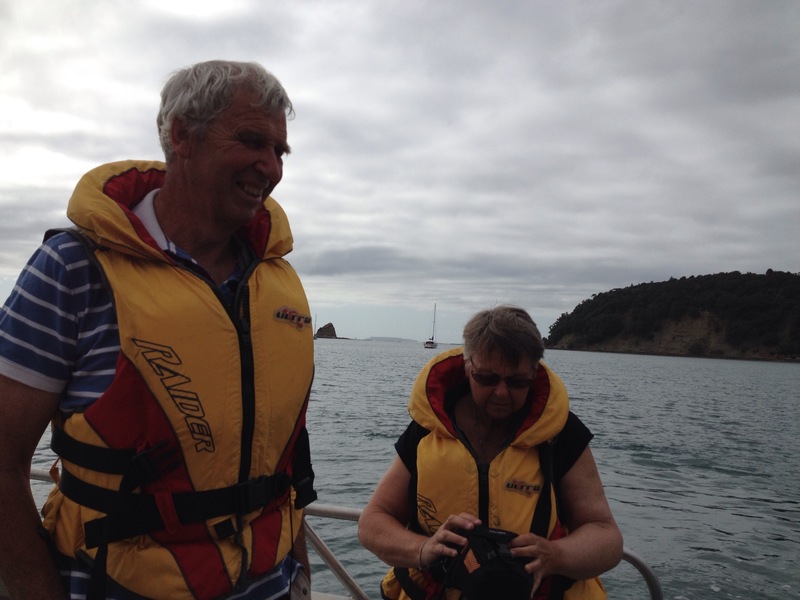 The following day Roy, Helen & Don took the ferry from Gulf Harbour for a day trip to Tiritiri Matangi, an island Sanctuary just a few kms off the Whangaparaoa Peninsular. 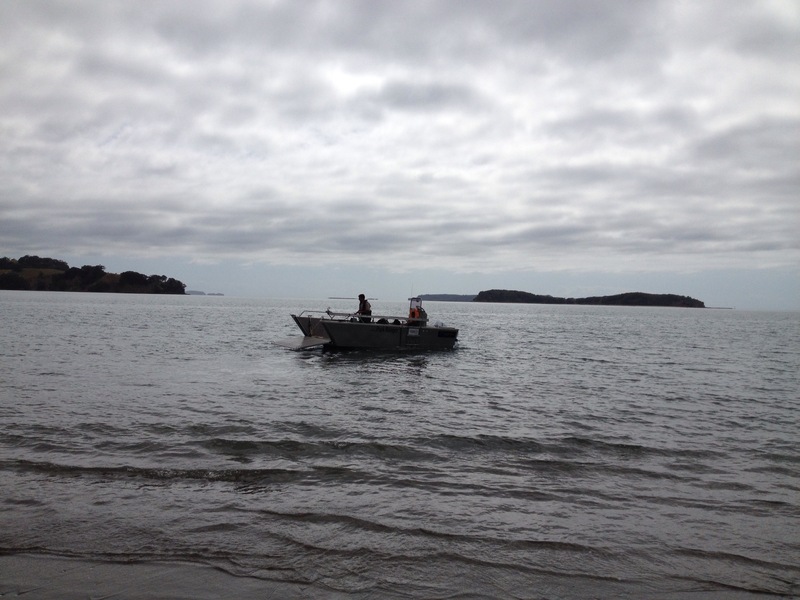 As I had visited the Island previously I decided to remain at the camp and get a few chores completed. 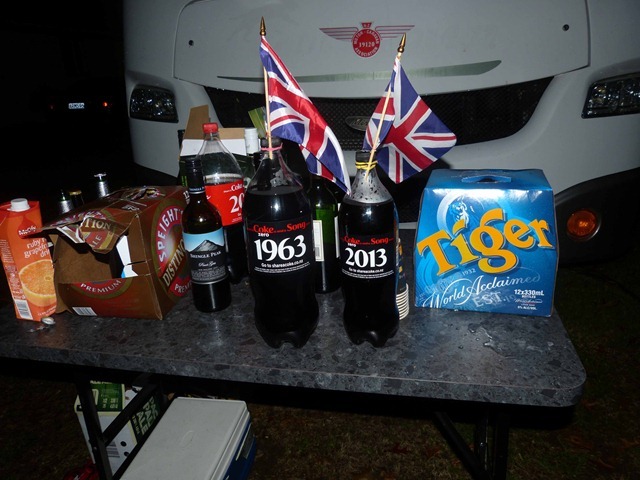 Roy will put up a post about their visit shortly……..really, truly, he WILL get round to it!!!! 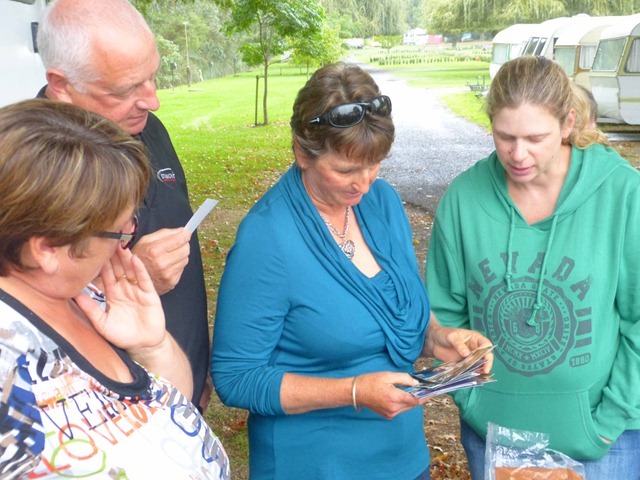 Roy and I left Helen & Don for a day whilst we headed down to Ararimu (south of Auckland in the Hunua’s) as long time friend Janet was having her 70th birthday, as well, we were celebrating Ron & Janet’s 50th wedding anniversary. 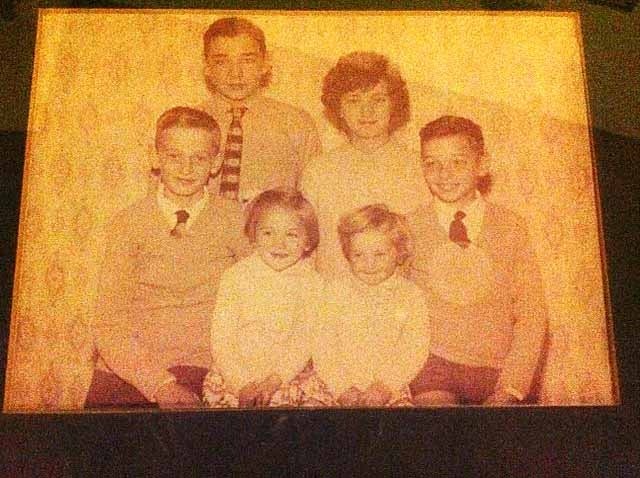 Roy and Janet started school together as 5 year olds all those years ago at Cockle Bay Primary, and then just 15 years later Roy was Best Man at Ron & Janet’s wedding. 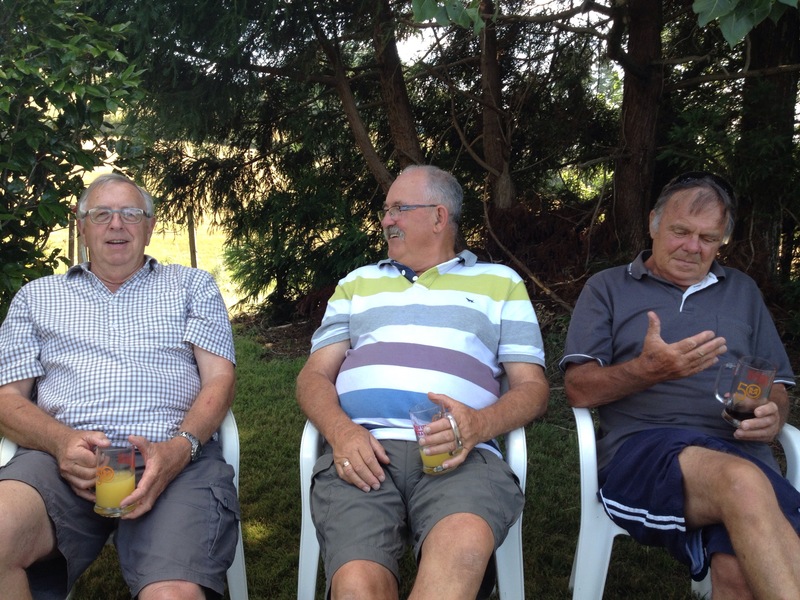 They, along with a few others have all kept in touch over the years and have remained friends all these years. Again, Roy will be writing about this …..soon! ‘ear all, see all, and say nowt!! Malcolm, Roy and Bill V.
Back at Shakespear we bade farewell to Helen & Don after spending a lovely week together and we look forward to meeting up with them again soon. A few days later Jim & Judy called In to see us and spend the day with us. They had no sooner left when Brian & Marj arrived to stay for a few days. It turned out to be a busy few days whilst Brian & Marj were with us as one day we had appointments to keep, another day they had things to attend to and in between Malcolm & Pat came out for a day visit. Of course, one neglected to have a camera around to take pictures! Oh and then there was the day last week when Roy & I headed down to Torbay to my brother Steve and sister in law Leslie’s place for dinner. 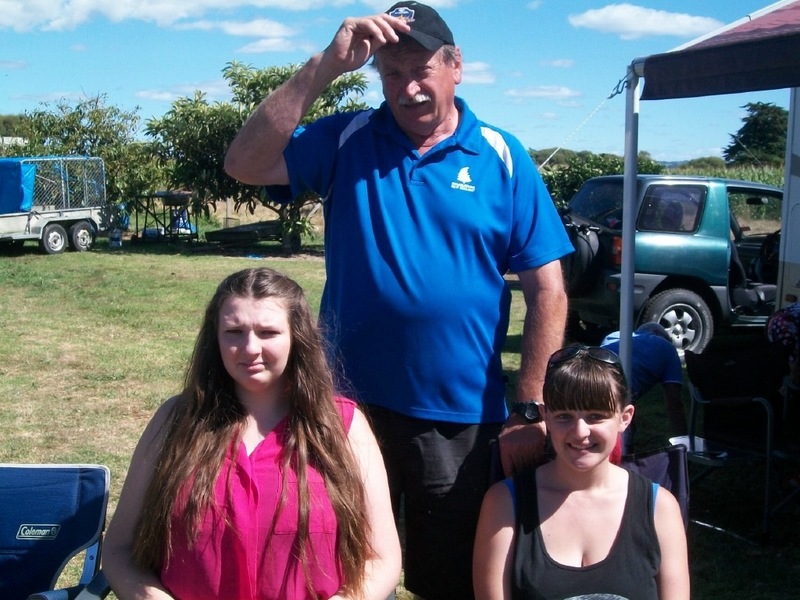 Leslie’s sister Gill and her daughters Emma & Jamie were over from Perth. It seems to have been a week of reuniting old long-lasting friendships as Gill & I started school together and went through primary and secondary school as best friends. Let us just say that the evening turned into one of those magic nights that you cannot plan, I don’t think I have laughed and sung so much in many years, nor drunk so much – the following day was a bit of a right off!!! I blame the young ones for leading us astray or for at least for bringing out the Cointreau bottle at the end of the night. Video recording of our awesome singing is not available for general viewing, but let me assure you it was very very good loud memorable! sitting around the table L-R Gill, Roy, Leslie, Emma & Jamie. 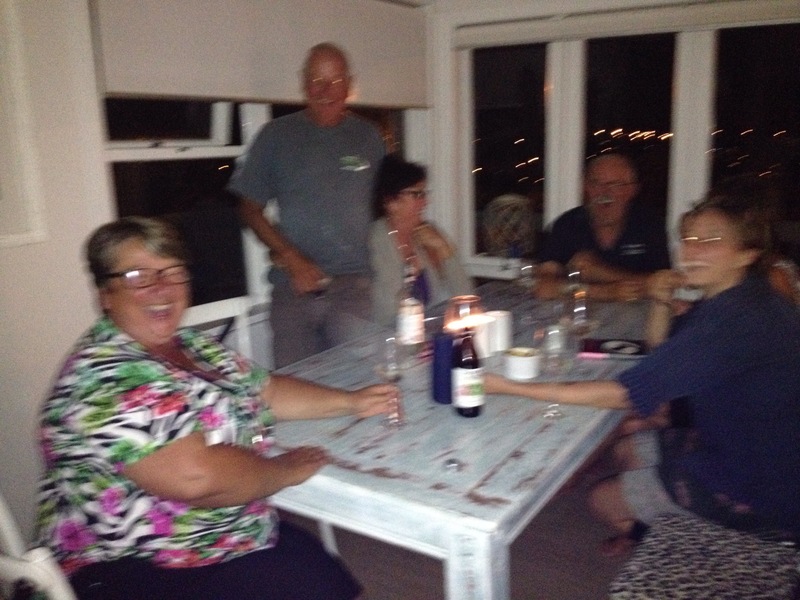 and this is how we looked at the end of the night – happy but blurred! Last weekend was Auckland Anniversary weekend with Monday being a public holiday. The weather again was forecast to be brilliant and with that in mind, Steve & Leslie came out to camp with us for the weekend. 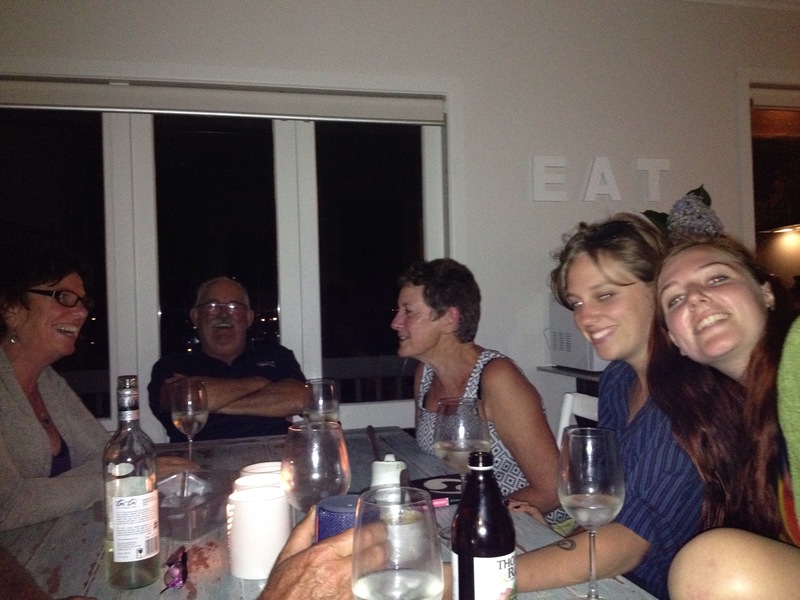 Let’s just say that the company was great, the food was outstanding, the fishing so-so with only two snapper big enough to bring home, the sea warm for many swims each day and that’s all we shall report! Steve & Les’ daughter Fran along with her husband Clive and daughter Bea came to stay on the Saturday night and it was lovely to spend a day or two with them. 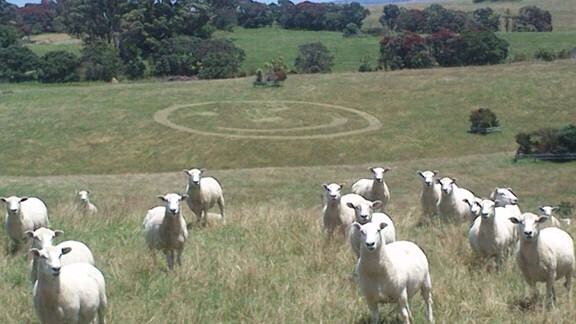 And to finish off here is a pic of the local herd of sheep looking very bewildered at the recent crop circle activity in the paddock behind them. Although we are pretty sure that Bruce had a little something to do with this! 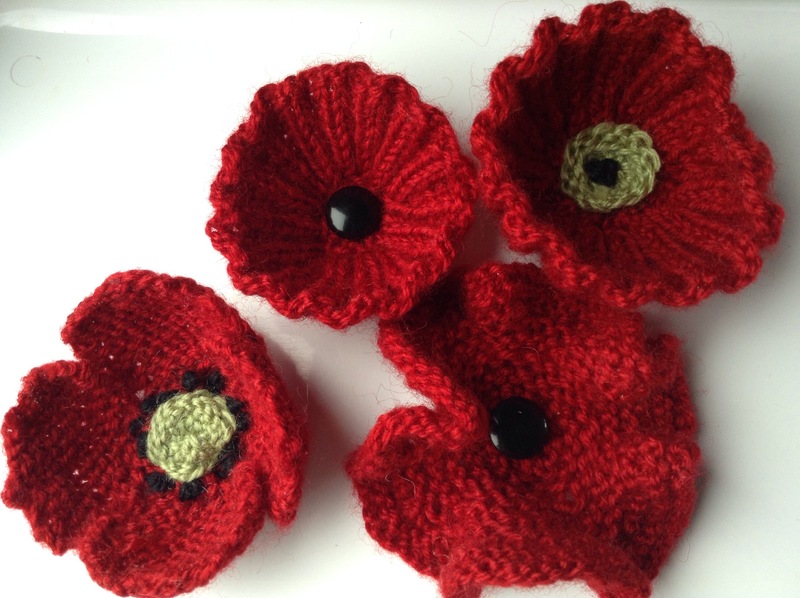 The knitting needles have once again been out, this time to knit poppies. 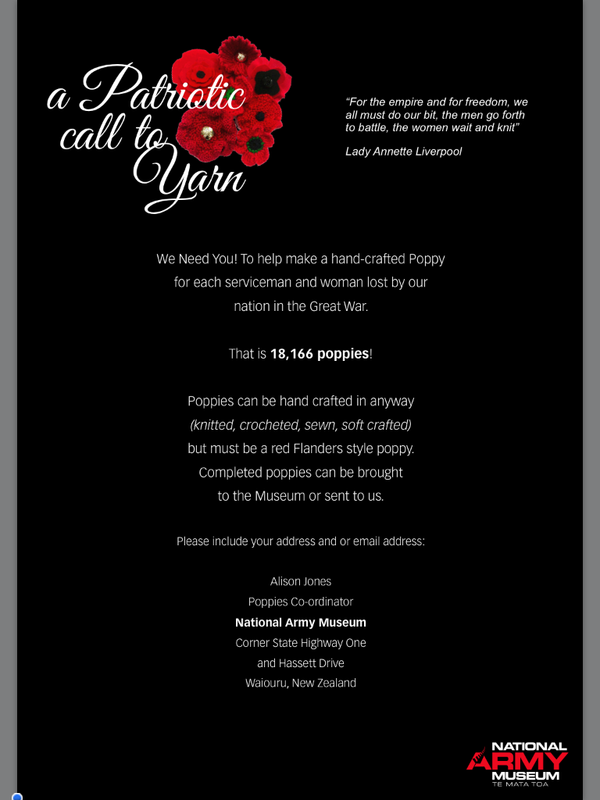 This is for a display to be held at the National Army Museum at Waiouru next year, the intention is to have one poppy on display for each serviceman and servicewoman who were killed during WWI – that is 18,166 poppies. I found I had a few scraps of red wool in my stash along with a little of the black and green required. I have also been able to raid my button stash. The buttons are from Mum’s button tin, my family thought I was nuts when, clearing out our parents home earlier this year, I asked if I could have the button tin! This caused great mirth among some of my siblings, and in the words of Mum, thought I was completely doolally. But here they are being used for a good cause. 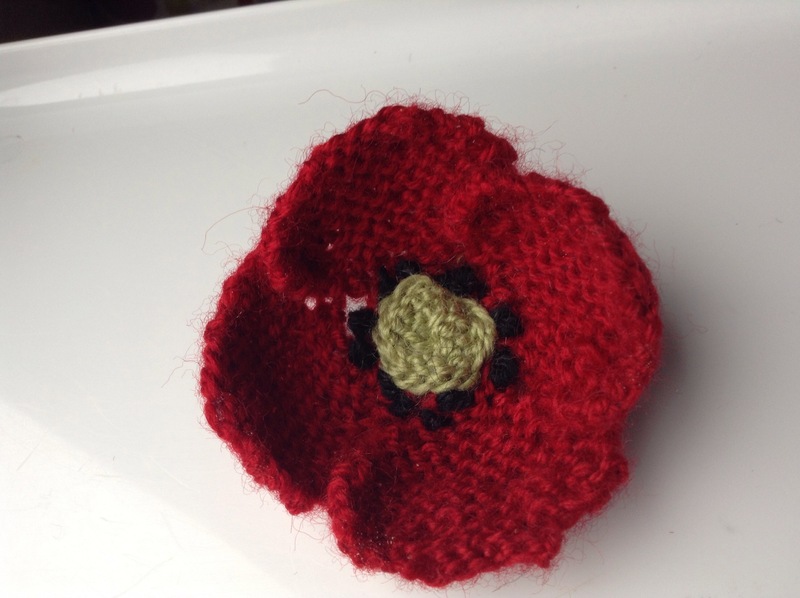 Since taking these pictures, I have knitted a few more and will continue to add to them as it is a good opportunity to finish off scraps of wool for a good cause. The Great War has great personal significance for us. Some of you will know, Roy’s father (also called Roy) was injured during WWI at Passchendaele, and his brother Luigi served and survived Gallipoli. 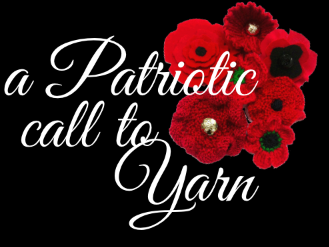 Whilst we were in Europe we did go to find the place where Roy Snr was injured, you can read about that visit here Something as simple as knitting a few poppies is my contribution to the commemorations. And the link at army museum will give you any further information. 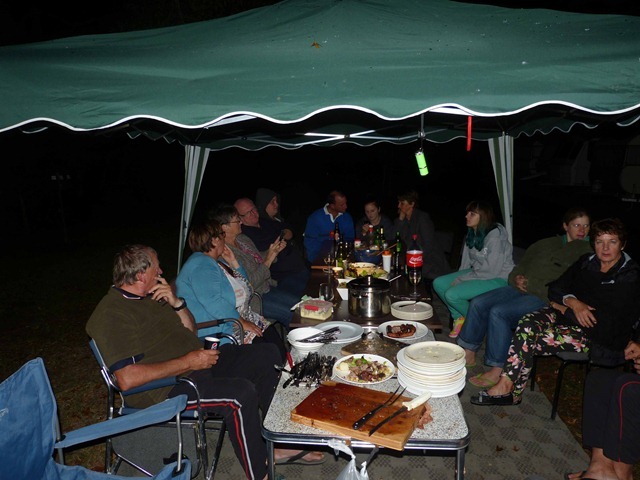 This last weekend was a gathering of the Coatham Family as it was 50 years since we arrived in New Zealand emigrating from England. Our journey was of course by ship, the P&O liner Oronsay, from Tilbury Docks London, via the Suez canal to arrive in Auckland on 22 April 1963. This is how we were in 1963! Not much change really after 50 years. Family started arriving on Friday. 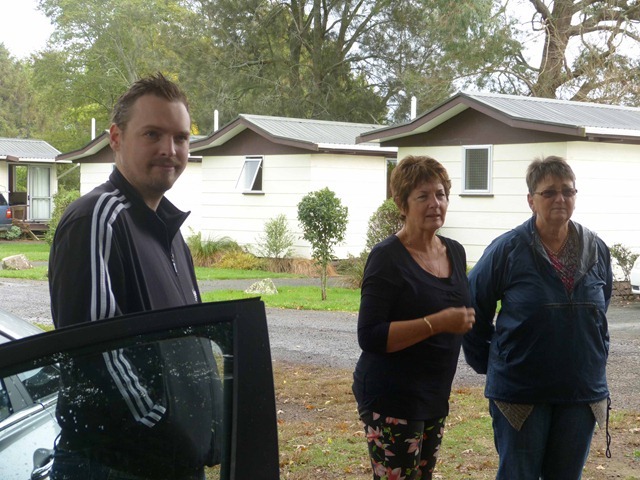 Roy & Bernice arrived at Awakeri Hot Springs to find that Mike Natalie & Stuart were already awaiting our arrival with Sue Jeff Jason and the twins arriving shortly thereafter. Steve & Les along with Fran and Clive were staying just down the road on Friday night but all turned up on Saturday morning. Sarah Shaun and their boys arrived and of course John & Julie were not far away. Hilary was next to arrive with Rebekka & Amy. Antony was the last one to arrive later in the evening. 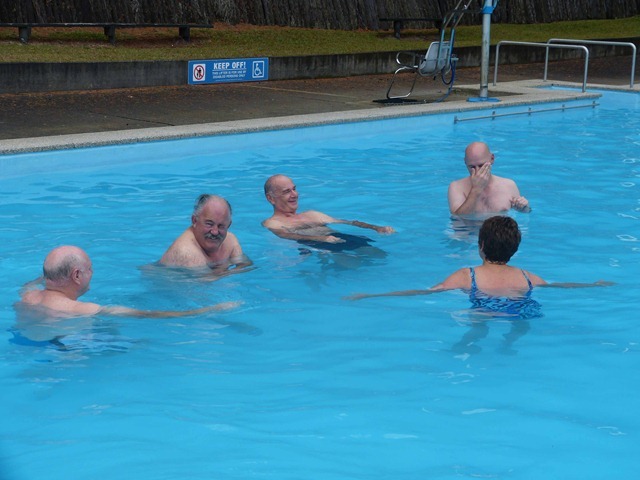 Some of us had been for a swim on the Friday evening, oh what bliss, before too long on Saturday the pool was invaded by a good number of family members. Of course food takes a major part in any gathering and lunch was put together before an afternoon of lots of chat with swapping of stories, photos and general catching up. Some of the cousins (second, once removed, never sure which is which!!) had never met before so it was a good opportunity to build relationships. We were fortunate with the weather with just a few odd light showers falling, unlike some parts of the country which were being flooded. We had planned to use the facilities of the venue for our evening gathering however, another group was in residence so plan B was put into place. 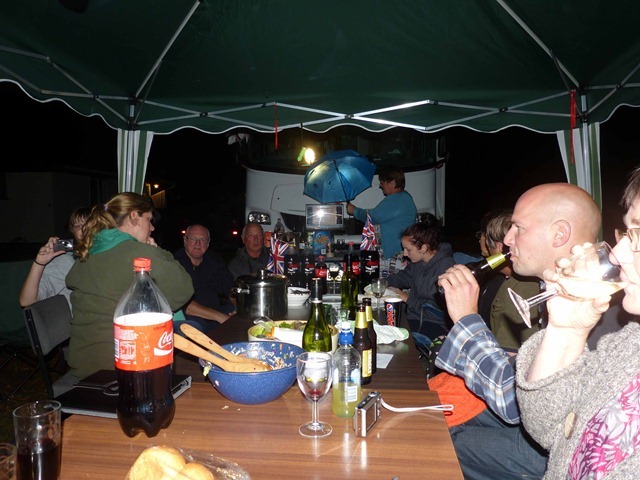 We put our large outdoor mat in front of the van (we were parked under a huge oak tree which gave us some shelter from the rain) and John had a large pagoda under which tables were set up. 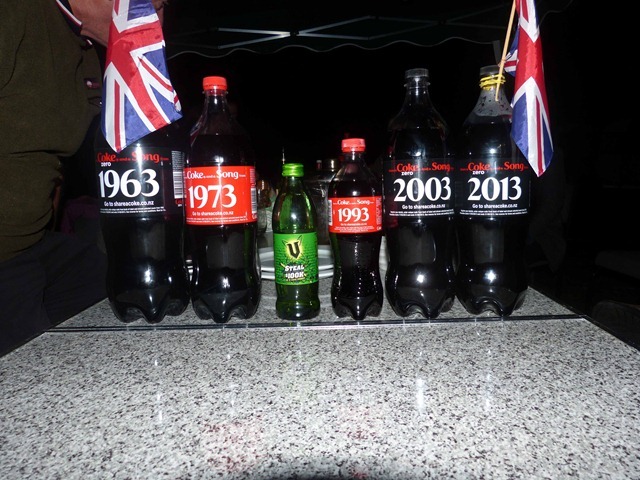 The decades in Coke! Oops..1983 went missing but an off course substitute was soon found. 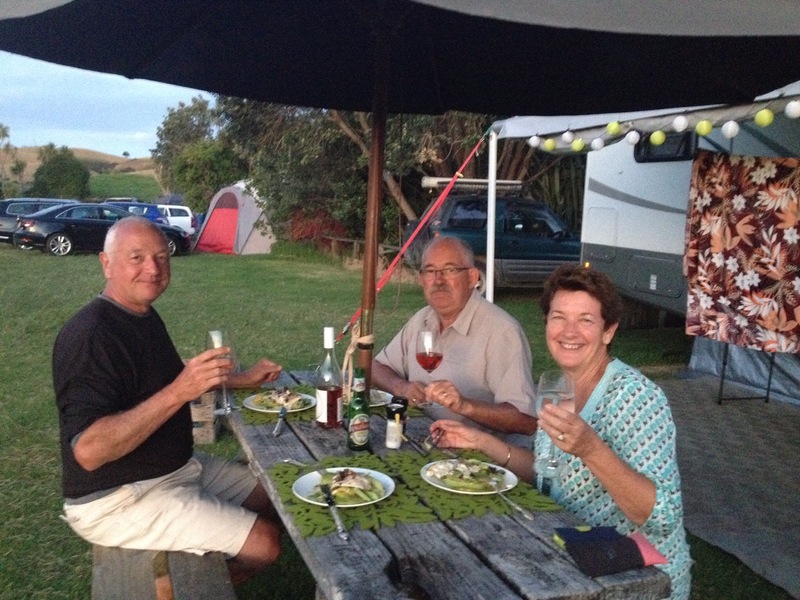 A toast was made to Hilda & Burnie (Mum & Dad) for bringing us all to NZ. Let the celebrations begin! A great repast was laid out for all with everyone contributing to a lovely evening of excellent food, drink & convivial company. Family members had contributed questions over the previous weeks showing that some have incredible memory for such things as car registration numbers, phone numbers, people, places, and events. Scoring was very liberal leading to a generally agreed four way tie. Some people could not refrain from answering questions in a somewhat loud whisper thus making it easier for their opponents. This last weekend was a long weekend for those who happen to be gainfully employed, and for us it was a weekend of family get together with fishing. Steve arrived Friday night and Saturday morning the three (Roy, John and Steve) were up at 4am to head out for the day fishing. 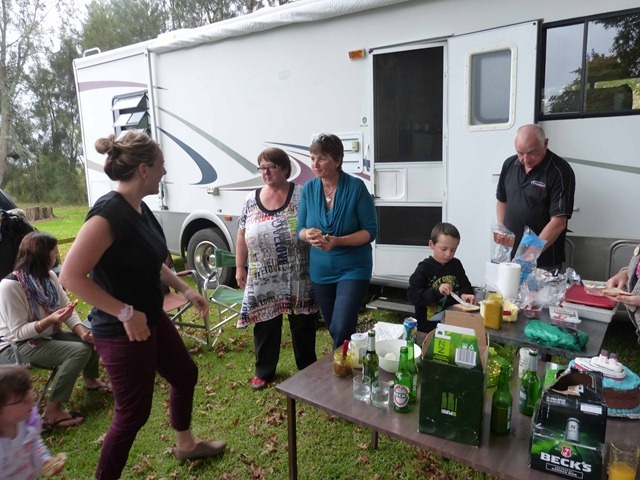 The Whakatane river bar was proving to be temperamental so plans were made to head up to Opotiki and head out from there. The morning was spent fishing however the fish must have decided to to head off somewhere else as not many were being landed in the boat. 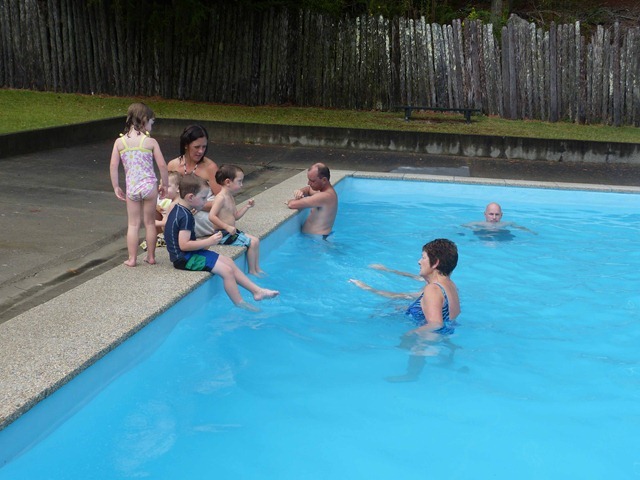 The bar at Opotiki had presented its own challenges i.e. 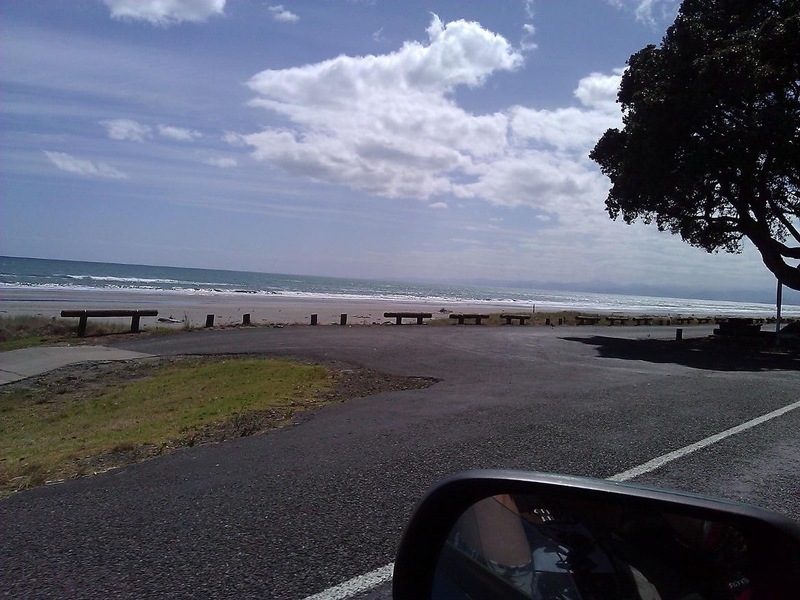 being very shallow even at full tide, therefore a phone call was made and Bernice and Julie hopped into a car and headed up to Opotiki to collect John’s car and trailer and bring it back to Whakatane. It was a beautiful day, and with stunning scenery along the way, and I spied many a good spot to explore on another day. 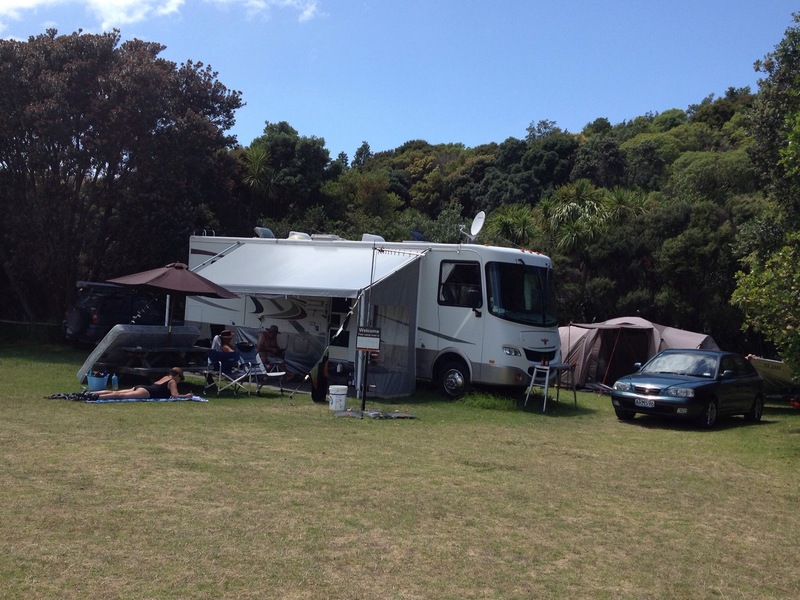 We soon arrived in Opotiki, collected the car and trailer before setting out on our return journey. The blokes arrived back empty handed, but with resolve to head out again on Sunday morning, allowing themselves a bit of a sleep in until 4.30am this time!! Late Sunday morning and other members of the family started to arrive, first Sue & Jeff followed shortly after by Hilary. 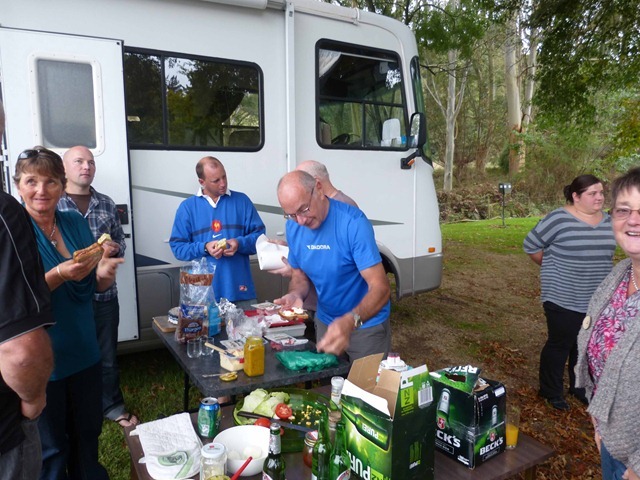 Not long after the guys arrived back from fishing, this time having had much success. The rest of the day was spent cleaning fish, catching up with family and generally enjoying the sunshine. 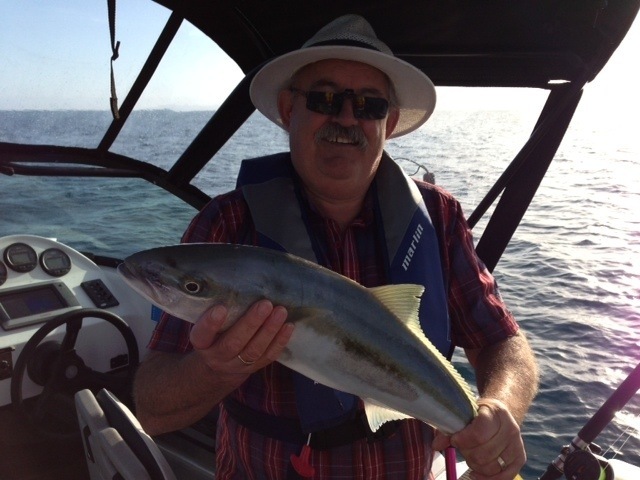 And to prove that Roy can actually catch some fish, here is the proof. Actually under size by 7 centimeters. Sunday afternoon and everyone left going in their own separate direction, Sue & Jeff to Putaruru via Rotorua, Hilary to Tauranga and Steve back to Auckland but with an extra passenger….Julie! 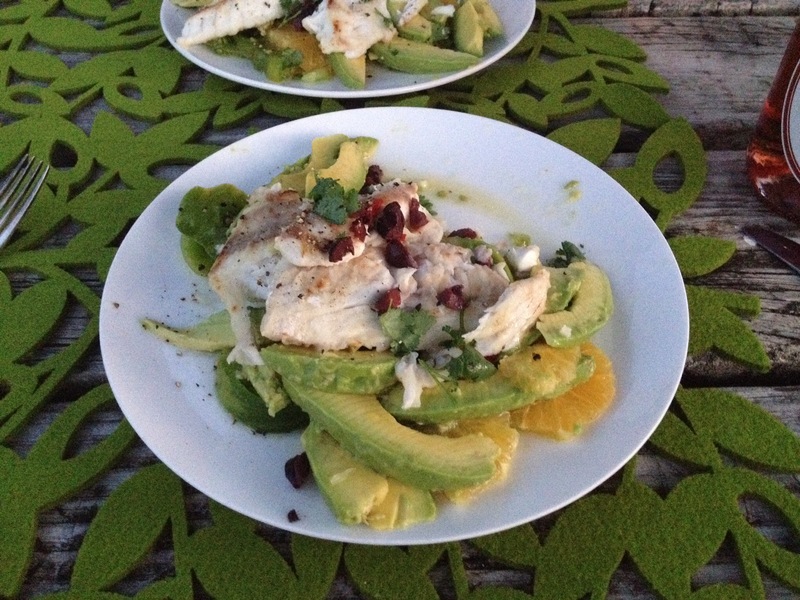 And all with a good quantity of fresh fish.